It already seems like an age since I bumped into a few friends at the PV of the Richard Devereux exhibition Continuous Now, at Tarpey Gallery, though it was only November. There is much debate about the work on show, mostly a fascination with the “how” rather than the more contemplative mode that I had expected. They’re enchanting paintings that probably aren’t paintings at all, and that’s part of what gets us into conversation before each work: “what is it?” not in the sense of “what does it represent?” but “what is this thing that I am looking at and how was it made?” They didn’t drop out of the sky that’s for sure but were they actually touched by human hands? They almost approach the acheiropoiesis of certain byzantine icons, that were supposedly made “not with human hands”. Their method of production, though it is clear that they were brought about by some process of making, is unfathomable, at least to me, and to those gathered at the PV, each of us offering our speculations, maybe they are printed, or possibly the process is close to photography. I get up really close to see if there is texture and if the smaller marks are really marks at all, much as one might check whether an image is a reproduction. I am searching for clues as to how the work is made. I take my glasses off and put them back on again. I look from the side and from the front, at different distances, and I am still unsure. Even when I decide one thing I later change my mind. helps me a bit, and I have to say that it does sound like painting, if not quite as we know it. Once I get over that I don’t know how they’re made and I get on with just looking at them. I am captivated, enthralled even, but not quieted. My state is more one of excitation, and it only very slowly gives way to something calmer. The paintings (?) are quite similar, monochromatic or almost so, always blue or turquoise, the parts entirely determined by the whole, yet themselves making up that whole, and only subtly differentiating themselves as ‘parts’. The differences between one painting and another becomes interesting. I have favourites, but it’s not easy to say why. I like the ones that don’t have a border more than the ones that do, and I attempt to rationalize why that might be. 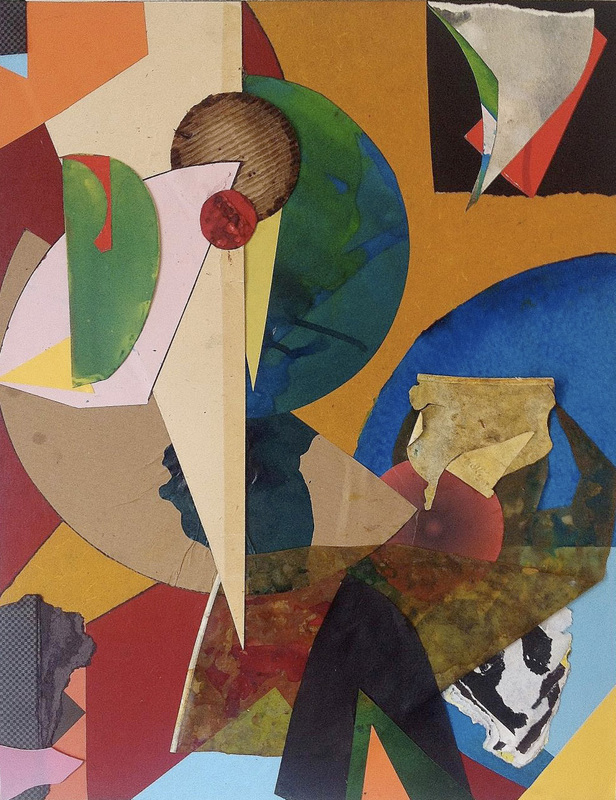 Is it that the border appears to display the work more conventionally, emphasizing the image more than the object, whereas in those that have no border the image/object relation is more ambiguous? 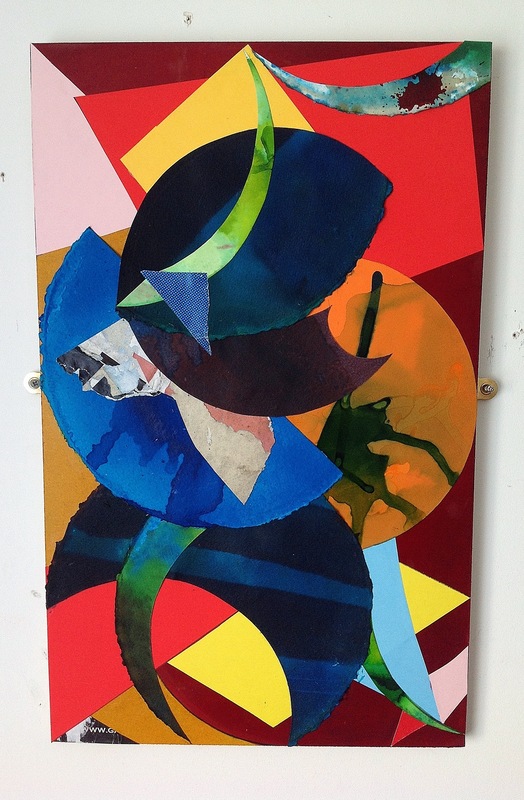 I am enjoying all of them, each individual work having something at times only slightly different to offer. In One Morning We’ll Slip Into A Harbour We Have Never Known and Other Places (series two) II, I sense that I am looking at a landscape but only long enough to be brought back to the surface by the homogeneity of incident and lack of representational markers. But the surface is difficult to discern, I know it is flat yet it contains a strange kind of illusionistic quality, as if it also contains the illusion of another surface, lunar or aquatic. Then again, maybe it is a kind of weaved fabric I am studying. Other Places (I) and Other Places (II), both small paintings, have obvious similarities as well as noticeable differences. Other Places (I) has more the appearance of movement, as if the image was fixed in mid flow, whereas Other Places (II) is static both in the sense of “still”and in the sense of an electrical buzz that is almost auditory, and it seems to hold more surface detail. It’s this second one that I like the most. I really like it and spend ages looking at it. Yet, I find it almost impossible to verbalize what it is that I am enjoying so much. I like the other one, but I like this one more, why? I am reminded of a time I was viewing a painting by Clem Crosby in a London gallery not so long ago. A critic who joined me pronounced an immediate judgment, something along the lines of “the colour is awful”. I made the mistake of asking him what he thought was “awful” about it, only to find that If I didn’t already know he certainly wasn’t going to explain it to me, it was so obviously self-evident. My own view was that the colour was rather good, but I would have been equally unable to justify my position. I am not at all sure that the words I have learned to say to myself are anything like an accurate report of my experience. Is this the whole point of looking? Almost that the more difficult it is to say in words what’s happening, the more interesting is the work, but that’s no reason to give up on the attempt! Nevertheless, for now, I just look. The work continually evolves, the work carries me – it knows far more than I do – I’m simply a facilitator. It is no longer idols or icons I have in mind, more the way that (living) systems invent themselves. I am thinking metaphorically, clearly paintings are not alive, yet we do tend to relate to them “as beings rather than things”. Is a painting akin to a self-organizing system, and perhaps specifically so in Devereux’s method, (though indeed I have little understanding, if any, of what that method might actually be)? The Chance and Order exhibition at Eagle Gallery takes its title from Kenneth Martin‘s early 1970s series of works, that he later developed into his Chance Order Change series, magnificent paintings in my view. The show brings works from the 1960s and 1970s by the British Constructionist and Systems Group together with more recent works by artists who currently draw upon this tradition. It is a mystery to me that this incredibly rich field in British art has been somewhat overlooked, when the paintings, drawings reliefs etc. of Kenneth and Mary Martin, Jeffrey Steele, and many others in this grouping are among the finest produced anywhere in the world. That they are being appreciated now by more than a generation of younger artists seems absolutely appropriate. 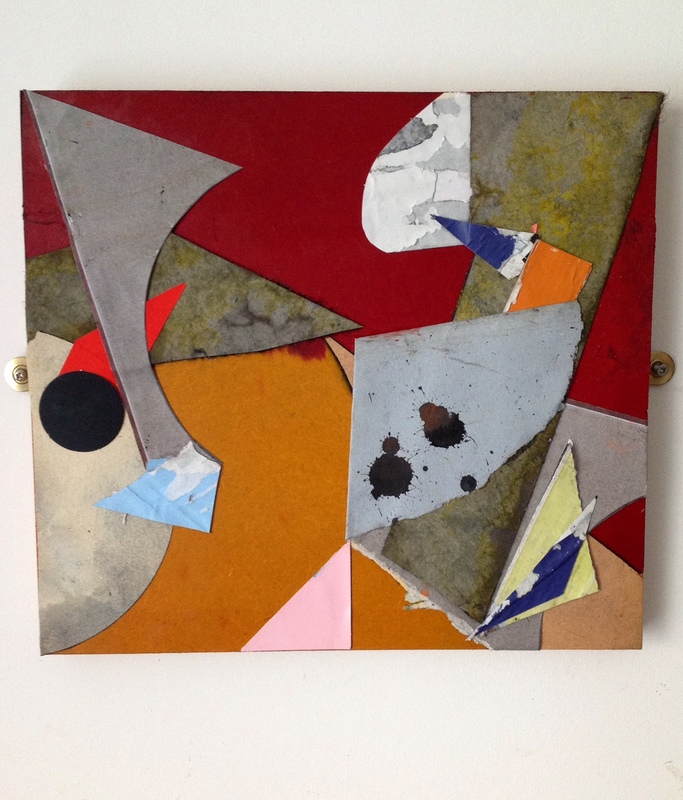 The two 2014 paintings by Natalie Dower are wonderful, both exploring the properties of Root-2 rectangles, which can be halved and halved endlessly and each time the rectangles will be of the same proportions. 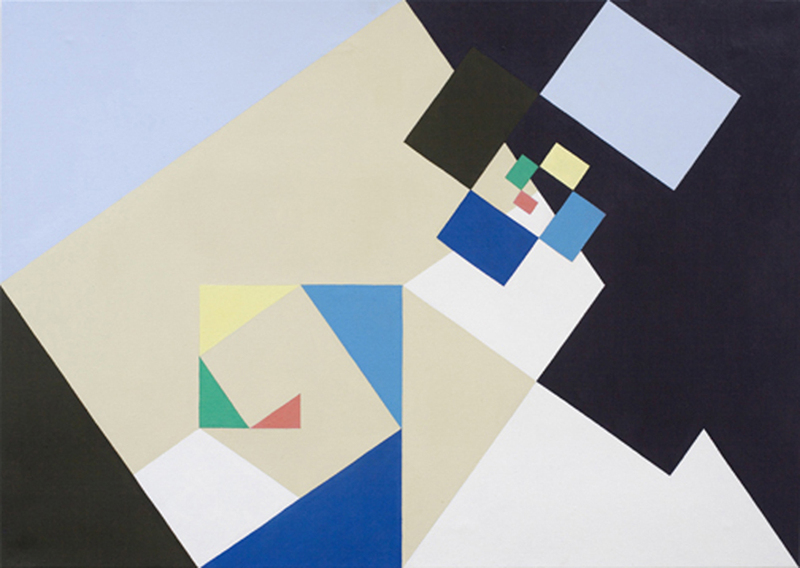 In these paintings Dower employs a rotating or spiralling movement to position repeatedly halved rectangles or triangles, (the triangles being derived by halving the rectangle diagonally), differentiating them using a nine colour sequence, in each reduction the triangle and rectangle shape share the same colour. There are nine moves, so nine colours are duplicated on two spirals tracks, one situating the triangular units and one the rectangles. On the first move the two units occupy the same area but in the subsequent diminutions the first two moves are in the same halves but then the track of rectangles curves inwards whilst the triangle track follows the periphery. The smaller scale units have priority over the previous, larger ones. If I am not mistaken Two Spirals No.2 is the inverse of Two Spirals No.1, in the same colours, used in different order. I read somewhere that the colours are “muted”, but that’s not really my experience, white may have been added, they are not quite primary and not quite secondary colours, but to my eyes the colours are high, with turquoise, cerulean blue, orange and yellow contrasting with Payne’s grey, white and a neutral base. 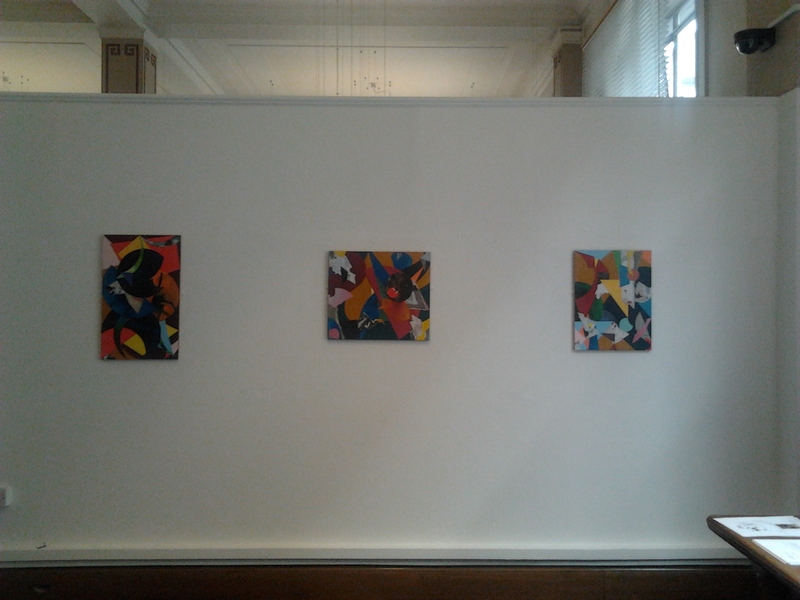 The logical relationship of shapes and the sequential ordering, is combined with the intuitive, in the form of two sets of choices: the system being explored and the colours used, an inventive fusion of chance and order that I am finding in each of the works in this exhibition. 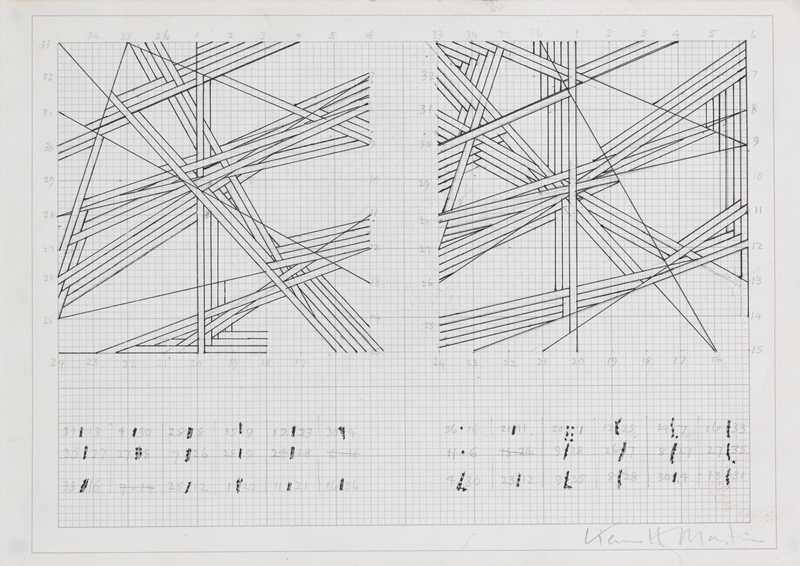 Kenneth Martin, Chance Order Change (2 Drawings),1978, pencil and ink on paper, 21.5 x 29.5cm. 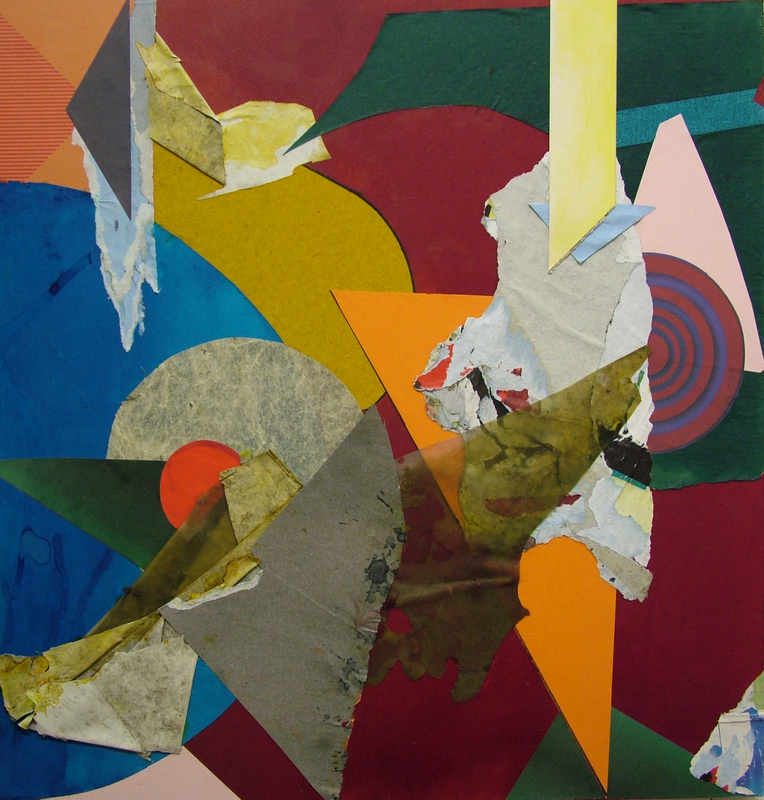 Copyright Estate of Kenneth Martin, Image courtesy of Annely Juda Fine Art, London. 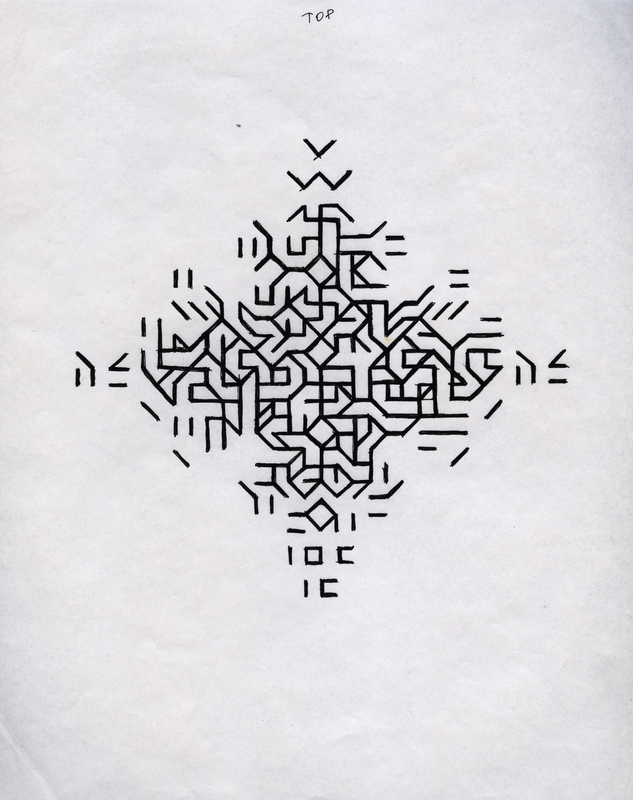 There’s a rotational theme too in the Kenneth Martin, Chance Order Change drawings, the paper having first been marked with numbered points, moving clockwise around the rectangle, the artist generated the lines by taking numbers, two at a time, at random out of a bag. A line was drawn between each successive pair of numbers as they were picked out. Chance determined the sequence and the number of parallel lines, the first drawn would have one line, the second two lines and so on. Change was initiated by rotating the drawing by 90 degrees and repeating the process for three rotations. The result is this intriguing network of lines which was then transferred to canvas. Order and chance may appear to be opposites, yet here their opposition is suspended, one being determined by the other. 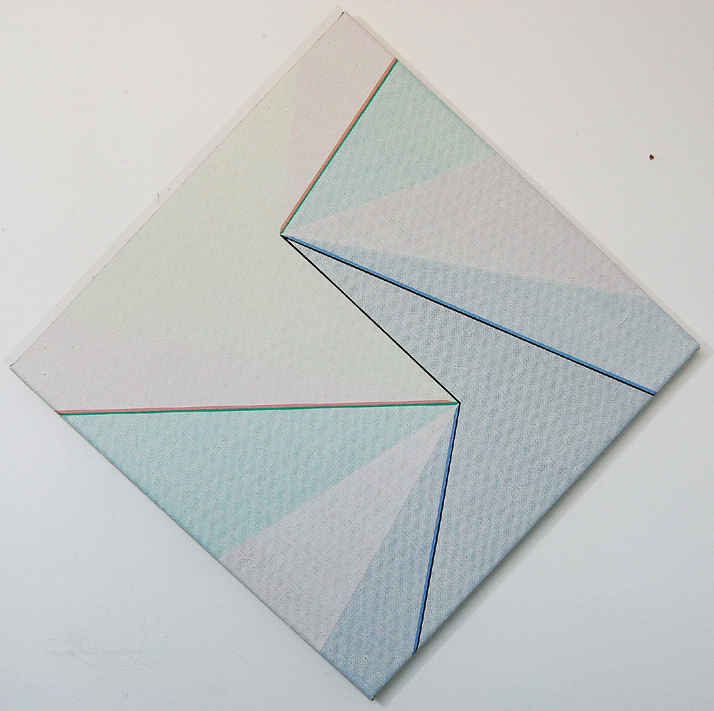 Katrina Blannin also employs rotation in her method, using the same double hexad starting point that has by now become familiar to regular viewers of her work, this time skewed to fit a square format, oriented to hang as a diamond shape, which is subdivided into triangles differentiated by a range of colours (yellow pink green red blue and grey) that get darker and then lighter in rotation. Narrow demarcation lines are also added. 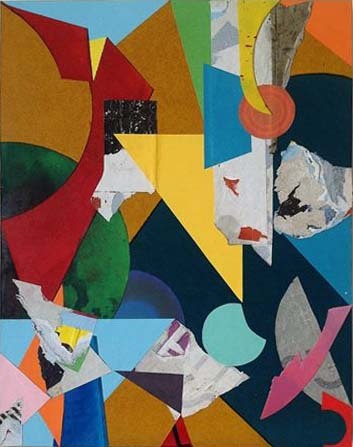 There is a sense in which the careful definition of parts leads to accurately separating flat areas of colour, yet they immediately set up fascinating, shifting spatial relationships that create ambiguity. I think of them oxymoronically as precisely ambiguous. 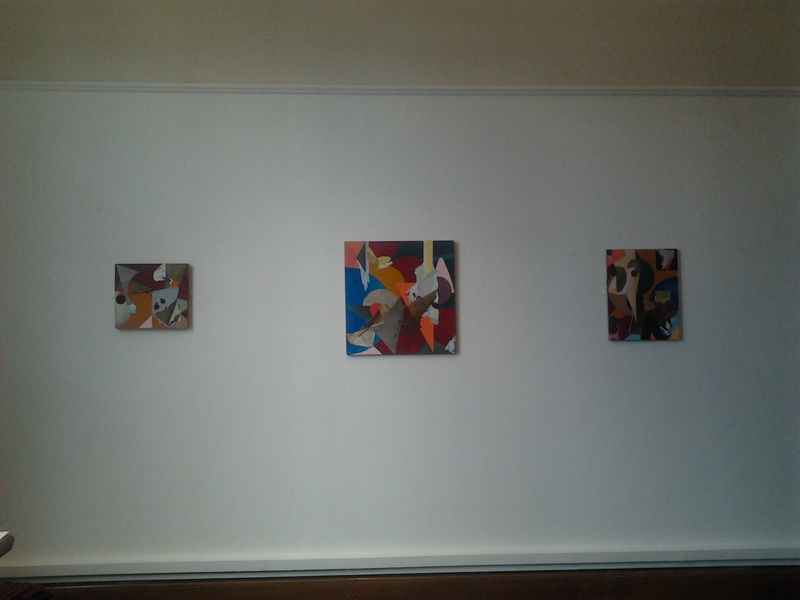 There are three paintings in sequence here increasing in size from left to right: 50 x 50 cm , 60 x 60 cm and 70 x 70 cm. Mary Martin‘s drawing for Cross, a preparatory study for the magnificent stainless steel on wood relief that won the John Moores prize in 1969, is a diamond shape on a square. In the drawing Martin uses six iconographic figures, one for each of the six positions of her basic unit of a half cube, cut on the hypotenuse, faced with stainless steel, that she used in the relief. The half cube, placed in six different positions and and then arranged in a variety of sequences results in an amazing complexity of form, as demonstrated in this beautiful drawing. There’s a similar strategy being followed in Jeffrey Steele‘s outstanding Six sets of 7 x 5 half circles in cinematic rotation. It does “what it says on the tin”, yet whilst the descriptive title may sound somewhat prosaic, the visual experience is surprisingly poetic. And this is where I am supposed to say that their approach is not “mechanical” or “formulaic”, because we seem prejudiced towards those ideas, preferring instead the illusion of freedom. So I am going to say the opposite: it is formulaic, mechanical, digital (though not virtual), and that’s good! These drawings and paintings are totally contemporary, dealing with the issues of our day, without ever representing them or commenting upon them. What we are faced with in these works, precisely because of their programmatic or systematic formality, are the big, dare I say existential, questions to do with freedom and necessity, chance order and change. Andrew Bick‘s OGVDS (Tilted Forward/straightened) v 5 is perhaps less systematic. Rather than numeric permutations of a single unit, we have more playful, serial variations on a theme, the theme being a particular grid arrangement that looks very different depending on changes to colour, texture, quality of mark and perceived depth. 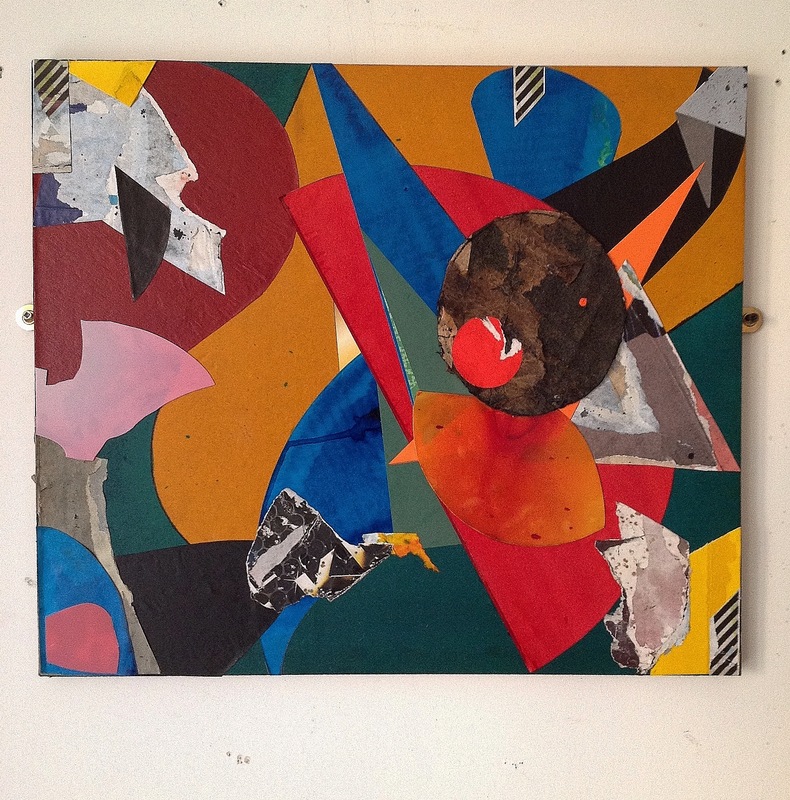 His work has been described as ‘gently disruptive and purposefully chaotic’, and it is easy to see this here. 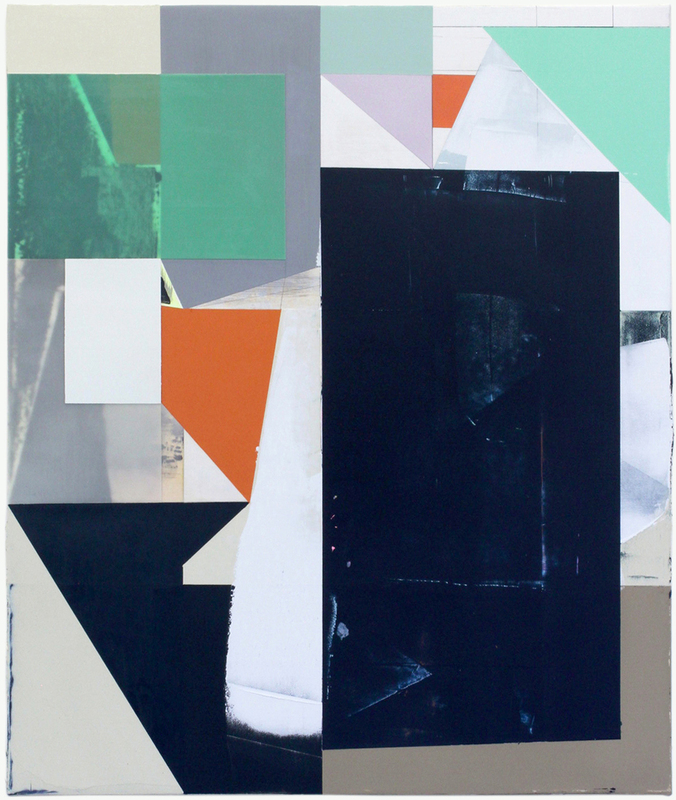 I like the gentle disruption in the spatial shifts as two large dark grey areas, an interrupted triangular shape at bottom left and a rectangular slab taking up nearly all of the right-hand half of the painting, first share the same literal plane and then snap into opposition, the larger shape receding in space in one interpretation, or jutting forward, in another, two orange irregular rectangles joining this game of push/pull, perhaps supporting the first interpretation slightly more than the second. The Martins, in common with many of the British Constructionists moved somewhat away from painting towards constructed reliefs, Jeffrey Steele on the other hand, and it would appear that this is also true of Bick, Blannin and Dower, have stayed with painting, In a recent interview with Steele for Turps Banana, (Issue 11), Blannin asks him “Why is it important to develop …the historically charged process of ‘paint on canvas’?” In his answer Steele says “I have always wanted to try to justify the supreme importance of painting” contrasting the painter with the artist-as-manager who has works made in a factory, arguing that in the latter process “you lose the evidence of the ‘journey'”, adding that “for me the ‘journey’ is worth knowing and (its) traces… are important to see”. In every one of the works in this exhibition there is such evidence. Perhaps the show itself evidences the continuation of a journey, starting out with the British Constructionists and reaching into the future, an exploration rather than a repetition, yet quite possibly, ending as T S Elliot would have had it, where we started and knowing the place for the first time.